There is something wonderful about crafting with others, getting out of your house and enjoying the fellowship of other gentle yarny folk. My first experience of this was back in Bristol in the UK in the winter of 2011. My local pub, the Victoria, a short stroll from my house, hosted a first Sunday of the month "Knit and Natter". The kids, younger then, were in bed and my husband happily watching Top Gear. There were eight of us knitting and I realized at that first meeting that I had been crafting in a silo up until then. We sat in the railway tunnel part of the pub (maybe it actually was a disused railway tunnel) - from a silo to a tunnel - and I enjoyed a pint of cider as you do in the West Country while we chattered about nothing in particular while our fingers were busy. Bliss. And then shortly after moving to Houston in the spring of 2012 I signed my kids up to swimming lessons and was delighted to discover a fellow knitter doing her stuff in public with children occupied at the same time as mine. And so an impromptu group began of four of us knitting together and it was the BEST part of my week. But after a year or so the children's activities changed and our happy yarny meet ups ended. Fulfilling the thirty hours of teaching crochet for my two certificates led to more communal crafting. For several months I carried my hooks and yarn everywhere looking for willing guinea pigs among my friends. 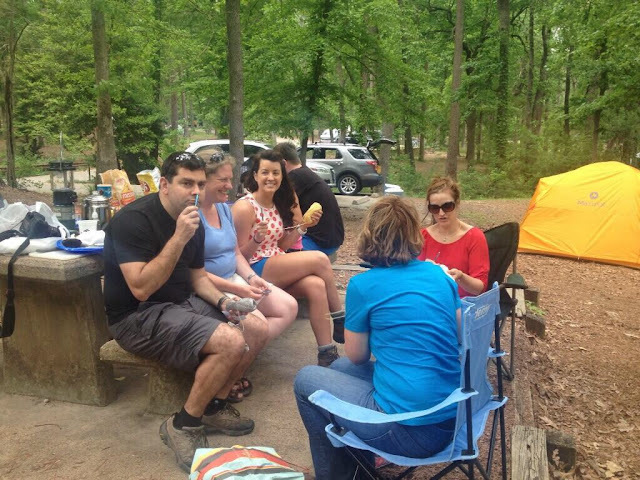 Pictured above several victims learning while camping at a Texas State Park! Asking the yarn store owner if I could teach on her comfy sofa led to my current job running their Friday knitting and crochet workshop. My master teacher asked me during my assessment if I was crafting with a group (the workshop doesn't count) and encouraged me to find one. Well now I have Yarn People at my public library each week (following my original knitting swim mom), a fortnightly craft group at church which has just started and my own monthly Yak and Yarn meet up at a local café which I started after attending a day long craft retreat in January this year. That's probably more than sufficient.